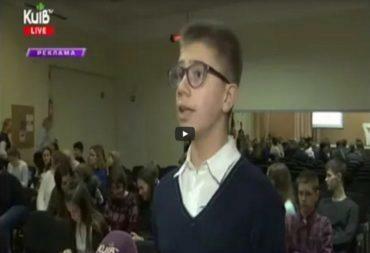 – How did you arrive at the decision to work in Ukraine, in Farmak in particular? – Well, when I have such an opportunity, why shouldn’t I help the neighboring country that is on the way to European Union? I knew Farmak long ago. It is one of the largest and most successful pharmaceutical companies in Ukraine. Despite challenging economic and political situation faced by Ukraine for the last 3-4 years, this Company has good financial standing and strong sales. The Company’s management comprises highly competent and educated employees. That being said, it’s a real challenge for me to work with such a team; and I feel great responsibility. – Was it difficult to start working in Ukraine? Do you perceive any linguistic barriers? – Can’t say for sure. The communication with colleagues was cautious at the beginning given that I still don’t speak the state language. In daily communications we use Ukrainian and English, sometimes we employ translator’s services when some details need to be clarified and misunderstanding to be avoided. It should be pointed out that my managerial colleagues and Company’s top management are open to cooperation in every sense, and almost 80% of them are fluent in English. I started learning Ukrainian a few months ago, however I already understand it on balance. So far, I don’t see any difficulties in work in Farmak and in Ukraine. I have deep respect for the Chairwoman of the Supervisory Board – Filya Ivanivna Zhebrovska who used to hold the position of the CEO and prepared excellent conditions for my work including support in communications and management. – What goals have you set for yourself as the Company’s top manager? – My highest priority is the development of the Company and accomplishments expected by the Supervisory Board. Then, I will focus on improving the Company’s business processes and structure in order to develop its presence in foreign markets. I care about quality, business development, state registration of medicinal products and medical devices, public and common procurements. I have worked in the pharmaceutical industry for 30 years and have valuable experience, which I can utilize to improve the Company’s business. The next important priority is to optimize the product line and promote products in view of demands of the domestic and foreign markets. One more of top priorities is to devise an efficient algorithm for improving and developing business in Europe. – What accomplishments would be satisfactory for you? – I will be happy when the shareholders find my work and my management satisfactory; it’s a team work. I will also be happy when investors, business partners, colleagues, trade union and employees are happy with my work, outcomes of Company management by myself. I understand it that all these groups have various interests, however we should seek maximum balance between them. 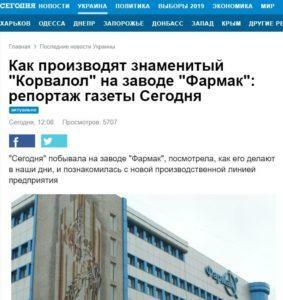 – What is Farmak’s place in the Ukrainian and European pharmaceutical markets, in your opinion? – Farmak is a leader in the Ukrainian market and we should continue holding this standing. The Company’s plans are to launch new products for the domestic market each year. Farmak upgraded the manufacturing facilities in compliance with European regulations and standards. It is beyond argument that the Company is a leader of the Ukrainian pharmaceutical industry. Concerning Europe now: Farmak used to arrange authorization and marketing of medicinal products via European, German, Dutch, Slovak partners. Business improved after procurement of Nord Farm, a polish company, that started applying for authorization and marketing of medicinal products. I expect Farmak’s presence to enhance throughout Europe. As you know, I worked in Europe for many years and have a definite experience. We want to work in European countries directly rather than via partners. Ukraine is on its way to Europe, and Farmak has a splendid opportunity to go up to leading positions among European countries, especially in Central and Western Europe, since it has a corresponding product line for the European markets and a number of projects developed. My target is to have the European countries to discover Farmak, to secure a foothold and further advance there, even with a potential to have facilities in Europe in order to work there on an equal footing with other pharmaceutical manufacturers. This market differs from the Ukrainian one having certain marketing procedures and operations. Farmak, in my opinion, will achieve success in Europe when an experienced team is appointed in production and certain processes are improved. When the targets are accomplished, I expect Farmak’s presence to improve in Farmak. – What directions and disease areas do you find perspective for exporting Farmak’s products? Today, Farmak’s share in the Ukrainian pharmaceutical market is 6.5%; the ratio between domestic and export sales is 68% to 32% from the Company’s revenue. Farmak has a substantial share in the insulin market providing recombinant insulin under Elli Lilly’s license to patients. This ensures Farmak’s strong position in endocrinology. We also secured market niches in such areas as ophthalmology and contrast agents. According to surveys held in 2016 and first six months of 2017, the Company was acknowledged the best country’s exporter. It should be noted that we export products in substantial quantities outside Europe, in particular to Uzbekistan, Russia, Vietnam, Kazakhstan, Iraq and other countries. Deliveries to Vietnam, for example, cover about 30 products. – How important is it for Farmak to participate in various governmental programs, especially reimbursement programs? – In my opinion, all pharmaceutical companies – when they wish to be successful in the business – should participate in governmental programs, including a reimbursement program; for Farmak being a market leader this is of special importance. For example, Farmak joined the reimbursement program in April 2017. About 8-10 medicinal products are included in this program, and I think we will expand the list over time. It is important that we should not only reduce prices but not face losses in this program. I believe it would be possible to due to large turnover. I would like emphasize that the Ministry of Health should discuss reforms and governmental programs that they plan with pharmaceutical companies and manufacturers. Unreasoned steps can lead to that domestic pharmaceutical manufacturers would not get stimuli for development, but, for instance, distribution companies would. National manufacture of vital medicinal products could vanish in the result. I would like to note that State’s support of domestic manufacture is an important factor and we would appreciate it in the future. – Is there competition between manufacturers and distributors in Ukraine, in your opinion? – It’s not about the competition. Distribution is a method of delivery of medicinal products to drugstores; distribution companies sell what has been produced. The State’s vision is that distributors are not responsible that key pharmaceutical products are present in the market. On the other hand, I believe we should focus on production and should go into logistics. We do not have any targets to establish own professional distribution company. It’s non-core business and considerable costs for pharmaceutical companies. – Do you think it is necessary to develop own production of vaccines and serums in Ukraine? – Full production and quality control of vaccines are a scientifically and technically complicated process requiring high-level experts and large investments, which is why pharmaceutical companies do not find it attractive. Farmak used to have plans to launch such production earlier; it would be possible to complete implementation of such plans on the condition of close cooperation with some foreign partners that specialize in such products because we ensure sterile and aseptic processing conditions in compliance with European regulations for the manufacture and quality control of medicinal products. However, Farmak’s near-term plans do not include such projects. In our side as a national manufacturer it would be more reasonable to create supplies in areas of our expertise, for example, in endocrinology. – What is Farmak’s vision regarding contract manufacture? Is it interesting for the Company? – As far as contract manufacture for other companies is concerned, we have no capability to perform such contracts so far due to shortage of capacities. Sales are growing, and we face a choice whether to seek partners to place our production orders with manufacturing facilities of other companies or to build new workshops. First of all, this concerns solid dosage forms – graes and tablets. Currently, we are testing opportunities of placing our contract manufacture in Ukraine and Europe, and we’ll make a decision in this regard in future. I should emphasize that it wouldn’t be a simple decision since it would be taken for a long-term run and influence our product range, what products we would apply for registration and where. At the same time, we are considering projects of API contract manufacture in our Shostka-based manufacturing site; we are having negotiations with some manufacturers. However, this market experiences high competition due to a great potential of API manufacture in China and India. – What are the Company’s plans for upgrading manufacturing facilities? – It should be noted that, today, Farmak has state-of-art manufacturing facilities. Certainly, there are still opportunities for upgrades, expansions, in particular, by purchasing a new production line and so forth. For this purpose, Farmak is seeking cutting-edge and effective equipment. As I’ve said, we experience shortage of manufacturing capacities for producing solid dosage forms as well as sterile and aseptic processing. We are carefully weighing the possibilities. 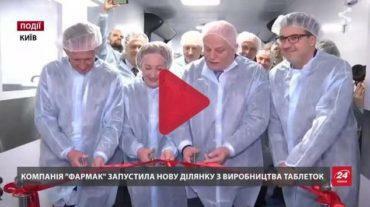 In addition to main Kyiv-based capacities, Farmak launched a new modern manufacturing site in Shostka for production of active pharmaceutical ingredients (API). When our Company is prepared to sell APIs produced in this manufacturing site in the European and US markets, our prospects are to arrange a US FDA inspection and EDQM inspection of the Shostka-based site. Farmak’s investment plans for capital expenditures are approximately UAH 630 mln. in 2017. – Are there problems with raising money for project development and production upgrade? – I am aware that the Company utilized a certain amount of borrowings in the past; however, today, Farmak has utilized and plans to utilize mainly own funds for project development. That being said, we are planning to invest in the development of projects about 230 million UAH. – What are Farmak’s accomplishments over first six months of 2017? – The Company demonstrated a significant increase compared with the same period in 2016. For example, revenue increased by 23% and we have marked improvements in the financial sector. This creates a good basis for the business for the second six months of 2017. We expect revenue of about UAH 6 300 mln. as of year-end 2017; gross margine is about 56%, EBITDA is about 26%. – What is your opinion regarding implementation of QR codes on packs of medicinal products in Ukraine, electronic control system? – We certainly support advances in this area; however, implementation of QR codes for all products means additional costs for the Company having a wide range of products. In my opinion, such a novelty would be more appropriate in a more stable period, after the crisis is overcome. – What do you think, how relevant is the issue of falsification of medicines and falsified products for the Ukrainian pharmaceutical market? – I am aware that such incidents occurred in the past but I don’t find it to be such a burning issue for the pharmaceutical market in Ukraine. We perform continuous market monitoring for falsified products, and when it comes to Farmak I promise we’ll react adequately. – How do you assess the competitive environment in the Ukrainian pharmaceutical market? How far, in your opinion, are pharmaceutical companies prepared for market competition or do they give preference to administrative pressure? – I need more time in Ukraine in order to provide more accurate judgment of competition methods in the pharmaceutical market. On balance, Farmak’s best route for competitiveness is high quality of products, attractive product line, high-skilled marketing team and appropriate reasonable marketing techniques as well as their transparent implementation. It means that Farmak plays fair by the market rules.